Evergreen trees continue growing throughout the year. Although they continue growing, they often need less pruning than deciduous trees, according to the Virginia Cooperative Extension. 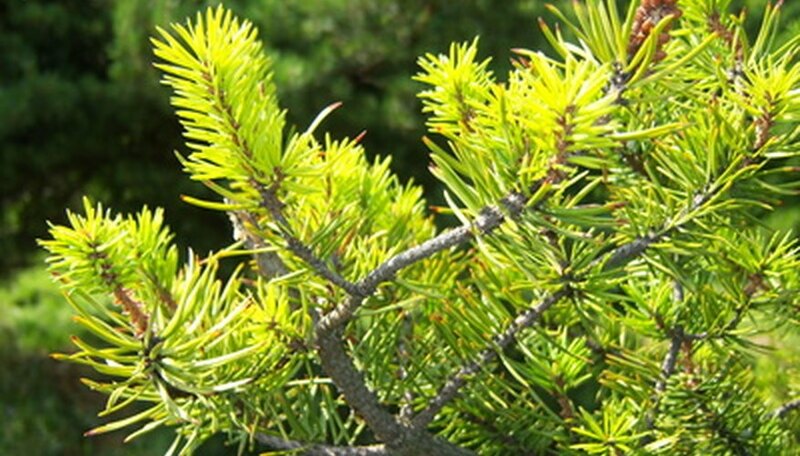 Evergreens include conifers, with their needle-like leaves and cones that carry the trees seeds, and broadleaf trees, which have larger leaves. Conifers rarely ever need training when they are young and require little pruning when older. Prune the first or second week in April in warmer areas such as Texas and in May for cooler regions, according to Agrilife Extension of Texas A & M University. Prune dead, diseased or damaged limbs from the tree first. When cutting diseased limbs, disinfect the pruning shears using listerine, lysol or rubbing alcohol between cuts, recommends the Virginia Cooperative Extension. Prune evergreen trees so that they are in their natural form. Do not shear large sections of the tree but instead cut individual branches, according to the University of Texas A & M.
Splint an evergreen leader when it is damaged during a storm or disease. The leader is the top most part of the tree that grows upwards. Cut off the damaged or diseased section and splint a lateral branch so that it is standing vertically. Cut lateral branches just below the splinted section, as recommended by the Virginia Cooperative Extension. Prune the branches around the central leader at the top of the tree so that they are 4 to 6 inches in leangth says the University of Idaho. Prune large branches by using the three cut method. The University of Idaho recommends makijng a cut at the bottom of the branch one to two feet away from the trunk of the tree. Make the cut a third of the way through the branch. Make another cut a few inches further out from the first cut on the top of the branch, sawing all the way through until only a stub is left. Cut the stub off the tree at the collar, which is where the branch extends out from the trunk.